The dreaded three-week break is nearly over and thoughts turn to the next GP on the calendar - Valencia. This is one we have looked forward to for a long time, not only because it is new but also because it promises to be one of the most exciting and challenging circuits introduced in a long time. For a while, we had only the map of the proposed layout to go by and that was intriguing enough. Uncharacteristically for a street circuit, there are some long straights included, together with a good mix of fast and slow corners. Add to that the setting within an old Mediterranean city with water forming a boundary to part of the track, even a bridge over a section of the harbor, and it was clearly going to be a magnificent spectacle. Now they have held a couple of sports car races on the track and virtual tours are multiplying on the net, so that we can begin to get an impression of what it will be like for the F1 cars and drivers. Again, it looks good, the racing having been successful and certain parts of the circuit providing distinctive features that will come to be instantly recognizable in the years ahead. Most notable of these features is the swing bridge across the harbor, with its triangular supports. So striking is this that it has been used in the logo of the official circuit website. Most GP circuits have an identifying landmark that appears in photographs and Valencia has stolen a march on the Tilkedromes of Asia in that its signature is a part of the track, rather than the usual fancy hospitality suites. Two other features spring to mind on looking at the latest pictures from Valencia. The proliferation of cranes clawing at the skyline remind us of how much of a rush job this was - the track is race ready but only just. And then there are the concrete walls. To take one of the tours, simulated or video, is to become conscious of how the walls separate the cars from the city. Down at the drivers' level, it is like hurtling through a severely restricted modern freeway through buildings that barely register on one's peripheral vision. Really, this circuit could be anywhere from the drivers' point of view - in a city or out in the country. For us it will be spectacular, for them it will be a daunting challenge with little room for mistakes. There are run-off areas but also Monaco-like sections where the touch of a wall could trigger a big accident. Overall, it does seem that Bernie has accidentally provided the sport with a circuit that could become a classic. We know that his idea was purely to cash in on the surge in popularity of F1 in Spain following Fernando Alonso's world championships, but the city of Valencia has excelled in its vision and delivery of this circuit. If there is anything similar in the history of F1 tracks, it has to be Long Beach, one of my favorites that always provided good racing. Yet Valencia promises to be even more, with its long straights and varied corners. Who is going to win the inaugural GP? The favorite has to be Lewis Hamilton, with both McLaren and Hamilton apparently in the ascendency; but I still hope for some sort of miracle happening in the BMW camp to confound all the experts. One thing is sure, however: if the race lives up to our expectations, it will be a humdinger. My only concern is that this event has been over-hyped. 25 corners is a lot and that must limit all the overtaking people are expecting. Equally a lot of people who normally only watch F1 have watched other classes race there and say there was lots of overtaking so the same will happen in F1. Those of us who regular follow other classes know that on many circuits there is a lot of overtaking until F1 turns up with its ridiculous technical regs and overtaking becomes a near impossibility. I have seen races on the Hungaroring with lots of overtaking but that is not what happens in F1. I think the idea of a circuit in the harbour area and a wide street circuit remind you of Long Beach. People have been used to street circuits meaning Monaco so they are in for a surprise in that respect. As with so many things Bernie has missed the boat commercially with next year's calendar. Look at the level of enthusiasm a three week break has generated even in the most cynical F1 fan. OK it's a new circuit this year but the same thing happens every year. When the audiences drop in the third quarter of next year do you think Bernie will put his hand up and say 'mea culpa.' Me neither. Of course the existence of the track blows Max's green credentials completely out of the water but I don't suppose anyone official will risk commenting on that. F1 needs joined up thinking and if Max wants to ride the green bandwagon he has to make sure nothing F1 does makes his claims look ridiculous. Given that F1's greenest team recently said they were working in four wind tunnels maybe it does make sense to build a new F1 circuit within 10 miles of an existing F1 testing venue but I don't think the tree huggers will see it that way. That is what I find so frustrating about the current kowtowing to the tree huggers, Steven. No matter what changes are made to F1 to appease them, they will never be satisfied until the sport has been wiped from the face of the earth. It is good that F1 should consider new and different technologies but, as a response to green pressure, it is bound to be as wrong as are the more extreme environmentalist notions. I don't think there was any lucre involved in the tree-huggers shutting up - the EU simply decided not to intervene and the environmentalists had no further avenue to prevent the event happening. I still don't understand why they didn't use Valencia's permanent track, or Jerez. They were, after all, already there, and no F1 race has raced on Valencia's permanent circuit either. The street-race craze may make sense in cities that have no track, but not for places that do - and especially not in places when they have to alter the course of the city river and possibly risk extra flooding in order to get it done. Steven Roy has a point about the environmental movement considering F1 inherently anti-green. However, in the case of Valencia, I think they had a point. From what I've read, the reason that the cities permanent track is suitable for testing only and not up to F1 race standards. On another note can someone give me some idea of the 'enviromental issues' as I seem to have missed that completely. I've noticed a lot in the last year or so that the 'Nimby' (not in my back yard) brigade seem to jump on the enviromental bandwagon if they're given half a chance. Keith did a very good blog post on the issues involved. I don't think the travel from the airport is relevant as it is only 8 miles from the permanent track but it is certainly true that there is more CO2 produced in transporting people to an from the circuit than during all the F1 running that weekend. 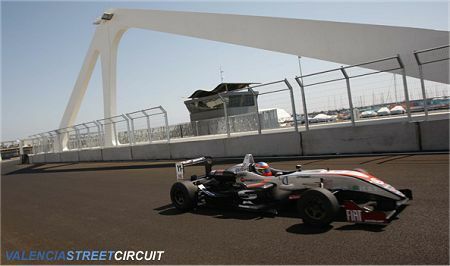 The permanent circuit has a safety certificate so the track itself and the medical facilities must be to F1 standards. All the other stuff may not be in place but it has to be easier to add facilities to an existing track than to build a completely new track and have to build them there. The problem with your argument in your final paragraph George is that for one track you have to include the environmental impact of constructing the track and it is going to need an awful lot of car journeys to be saved to overcome that. ah ok thanks for the linkage, has cleared it up a bit for me. I take your point about the carbon footprint of construction, it's prolly bigger than the footprint of the entire of the event. What bugs me about this kinda thing is the greenys insistence that motorsport is bad for the enviroment while jetting around the world to talk about how there gonna kill off whatever it is that has upset them this year. I'd love to see a carbon footprint comparison for F1 versus almost any other sport with the same kinda popularity, I have a feeling it would be a lot closer than most people think. Long Beach is a good comparison, though since most of the moving pictures I've seen are from driver's point of view. In Long Beach, Shoreline Drive is the only stretch where you can see over the walls and really know where you are, aside from the radio dying under the overpasses. In Valencia, I didn't notice the bridge from inside the car, and like you said, you could probably put these concrete barriers anywhere and the drivers wouldn't know the difference. I really hope that the setting translates itself to spectators on TV, because I also agree with the sentiment that Formula 1 may not be able to overtake as well as predicted. I'm surprised at the amount of runoff on more difficult corners, though, the likes that don't happen on old ChampCar circuits, so I don't think there will be any stupendous bounces off concrete... well... maybe there'll be just one or two. Sorry, off topic here, but Mad - if you're reading, how great was that move by the two Rizla Suzuki's at Brno on the weekend? Now back to matters four wheeled, I am really looking forward to the race this weekend. Three week break, sure, but mostly because it's the new circuit. Promises to be some action ! Hi PP. It was great, it's nice to see the Suzukis doing a bit better; I had high hopes for them this season which haven't quite panned out. George, I did a lengthy blog post about the environmental stuff last December, but basically the track construction altered the course of the river that flows through the city, increasing the risk of flooding. It was considered by the environmentalists that poor planning had been responsible, leaving the city authorities in breach of their own planning laws. Luckily for Valencia's bigwigs, the EU eventually cleared them of any wrongdoing. Also, Valencia is marketing itself as an ecological city. Quite how this is compatible with having a street race as well as a permanent track is a mystery to the environmentalists. In this case, it's not so much a question of motorsport being bad for the environment (except in the case of the Formula Verda single-issue campaign group) but of this specific development being bad for the environment in one city. I take it this circuit will be different to the Valencia MotoGP uses, which is actually a very good circuit too. Look forward to hopefully a challenging circuit with some suprises. You take it correctly, Pootle, the Valencia street circuit is entirely new and MotoGp uses an existing circuit outside the city. I think the reason for creating a new circuit for F1 rather than use the old one was the added spectacle of a street race, as well as the fact that the old track is a bit short for a GP. It looks like a good decision, apart from environmental issues, because the new circuit looks as though it will produce great racing.